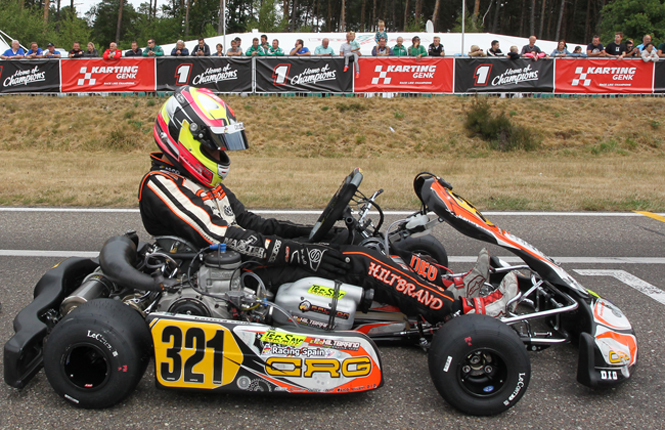 The CRG driver Pedro Hiltbrand is Vice Champion but lost the chance to get the European KZ2 Championship title. Puhakka stopped by two incidents in KZ's final stages. The farce of the dropping nose cone. Max Verstappen in Genk at CRG's motorhome. Joy, hope but also disappointment for the missed result in Belgium due to a series of very unlucky circumstances. These are the feelings after Genk at CRG-Maxter, especially for Pedro Hiltbrand, who missed out on the European KZ2 title, and for Simo Puhakka, that saw the victory slipping out of his hands when it seemed at reach. In KZ Simo Puhakka has been the main protagonist of the Belgian weekend ahead of the final stages, as he has been competitive in qualifying ending just 7 thousands shy of the pole position and in the heats where he pulled two victories that earned him a pole position start in the Prefinal. The first corner of the Prefinal has been fatal for Puhakka though, as he went wide on the humid tarmac and then was involved in an incident. That was the start of a calvary that relegated him to the final P13. Things went even worse in the Final. At the start, he has been hit by a rival at the second corner and due to this push he also had a contact with Andrea Dalè. That was the end of it, and not only for Puhakka but shortly after also for Dalè. That was a real pity as Puhakka displayed great speed in this round thanks also to the CRG Road Rebel chassis, to the Maxter engine and to the overall setup. The KZ Final was eventually won by Iglesias. The European Championship went Camponeschi's ways. He secured the result on Saturday thanks to the points obtained in the heats. Disappointment in KZ2 has been even stronger. The Spanish driver of CRG, Pedro Hiltbrand, did not manage to secure his first International CIK-FIA title after the second place in Sarno and the victory scored in Zuera. Things should have been easy in Genk for him, but the unthinkable happened. After showing great speed in free practice early in the weekend, something went wrong starting from qualifying, when Hiltbrand only set the 28th time. This turned out to be a higher damage than expected. Starting all the heats from the back, the Spaniard had to retire due to an incident and then in the final heat of Saturday he found his way blocked by an incident involving five karts ahead of him and has been hit by a 30s penalty (dropped nose cone) that relegated him to the 23rd spot of the grid of the Prefinal. In Prefinal Hiltbrand ended 14th, while in the Final he was ninth but the seven points obtained in this way have been useless. His rival Johansson, ended third and secured the title totaling 3 points more than Hiltbrand. In KZ2 things did not go well for Felice Tiene either. Started from the front row of the Prefinal due to his three great victories in the heats, he was pushed out of the track at lap two. Tiene managed to recover well up to P17. In the Final, he (and 7 other drivers) has been hit by the 30s dropped nose time penalty and therefore ended 26th. The best result for a driver on CRG chassis was scored by the German Maik Siebecke of SRP Racing Team, who was fifth. Regarding the works drivers, the Brazilian Gaetano Di Mauro was 18th, Fabrizio Rosati 31st due to a 30s time penalty after ending sixth in the second chance race. The other Brazilian Enzo Bortoleto, could not go beyond the second chance race as happened to the Japanese Fuma Horio. All results are available in the websites cikfia.com and cikfiachampionship.com. A TV special on the race will take place on Motors TV in the coming days.